It’s time for a small spice guide for all you kitchen enthusiasts. You’d always go to the spice section of a grocery store and you wonder, “Which spices should I be hauling now?” You bought a lot last time but you haven’t even gotten them out of the storage in your kitchen shelf for months now. 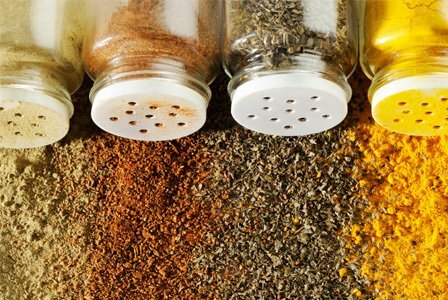 So you don’t want to waste more shelf space for spices that you won’t be using. Here is a quick rundown of which spices to buy. Need to drink more water? Here are tips to get you to drink more! What does it really mean to be a vegan? What on earth is an asafoeidandajsdbsajdhsad? ? I can’t cook complicated stuff. Now I’m looking at complicated ingredients? CINNAMON is really great in coffee. I can literally make my own Starbucks at home thanks to it. Spices are easy to incorporate into our meals because you could hardly notice them being healthy. It’s actually an amazing thing. I love adding spices to our meals, I didn’t even know it was healthy because it tasted like sin! There’s actually turmeric tea being sold for medicinal purposes. I’m not sure if it’s the same thing as the usual spice because I haven’t tasted it. I would rather read something than watch a youtube video. I highly appreciate contents that are well-written. Red chili really does boost metabolism. That’s why eating something spicy makes you want to go to the bathroom almost immediately. My family (my kids mostly) don’t like these spices in their food, especially turmeric. It would be great for them to have the health benefits of it but if they don’t like how it tastes, I wouldn’t force them. It’s nothing major, so don’t sweat it. As long as you give them healthy food- they’re all good. Cinnamon is probably the most acceptable thing here and red chili. I didn’t even know that there’s such a thing called organic turmeric. I love everything with chili, I guess my metabolism is all good! !